In a recent interview, Bishop Gerald Kicanas of the diocese of Tucson made some interesting comments that deserve public scrutiny. He discussed the upcoming November Presidential election, as well as the upcoming November United States Conference of Catholic Bishops' plenary meeting. It is clear the bishop confuses the already confused Catholic reader. LifeSite.com recently wrote: "Bishop Gerald Kicanas is among that cadre of US bishops who is himself well liked in Democrat and liberal Catholic communities for his vocal support for left wing and "progressive" peace and justice issues. Bishop Kicanas was praised by the aggressively abortion-supporting Governor of Arizona, Janet Napolitano, for his 'softer' approach to pro-abortion politicians using Catholic venues to publicize their positions." "The inviolability of the person, which is a reflection of the absolute inviolability of God, finds its primary and fundamental expression in the inviolability of human life. Above all, the common outcry, which is justly made on behalf of human rights - for example, the right to health, to home, to work, to family, to culture - is false and illusory if the right to life, the most basic and fundamental right and the condition for all other personal rights, is not defended with maximum determination" (Pope John Paul II, Post-synodal Apostolic Exhortation Christifideles laici, "On the Vocation and the Mission of the Lay Faithful in the Church and in the Modern World," Dec. 30, 1988, No. 38b). "A person who procures a successful abortion incurs an automatic [Latae sententiae]2 excommunication." At the very moment that the abortion is successfully accomplished, the woman and all formal conspirators are excommunicated. Yet Bishop Kicanas further states the question of formal cooperation in an abortion has not been answered by the Church. It has been answered - one cannot promote abortion or homosexuality or any of the other evils against innocent life without the prospect of excommunication and expectation of discipline of canon 915 [the denial of Holy Communion]. Conspirators who incur the excommunication can be defined as those who make access to the abortion possible. This certainly includes doctors and nurses who actually do it, husbands, family and others whose counsel, legislation, promotion and encouragement made it possible for the woman, and those whose direct practical support made it possible [financially, driving to the clinic etc.]. Bishop Kicanas further responds that people are trying to pit one bishop against another on the issue of denying Holy Communion. Is it not a reality that it is the bishops who are not united in the Catholic faith and 'they' are a house divided? 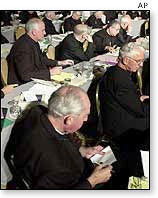 The people in the pews are not conspiring but are simply watching, questioning, why does this conference of U.S. bishops fail to obey the Divine Law of the Church. This decision to enforce c. 915, properly speaking is not a sanction or a penalty. Nor is the minister of Holy Communion passing judgment on the personÕs subjective guilt, but rather is reacting to the personÕs public unworthiness to receive Holy Communion due to an objective situation of sin. Bishop Kicanas next says that the USCCB is having a discussion regarding pro-abortion politicians 'after the elections' because the conclusion could be "misused" [sic]. Many are wondering who would "misuse" such a discussion? Is it at all possible that the 260 plus U.S. bishops who failed to enforce canon 915 against pro-abortion politicians fear upsetting their pro-abortion politician friends and upsetting a potential Democrat Party win by discussing it at an earlier time? It's interesting that Catholic politicians make up the largest denominational religious group in Congress with 25 Senators or 25% of U.S. Senate and 130 Congressmen or 30% of the House Representatives. 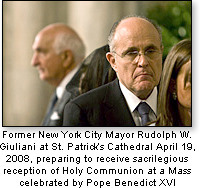 Yet, barely a handful of these Catholics in the public square are in communion with the Church. The bishop's inaction against pro-abortion politicians leads some to wonder why we need to pay for a 'Conference of Bishops' or an expensive USCCB organization, with hundreds of employees at their massive Washington, D.C. headquarters, when they have decided to each go their own way, agree to do their own governing and discipline regardless of what the Pope and Canon Law mandates? 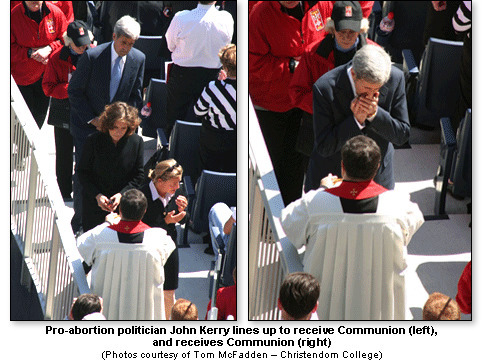 In June 2004, the USCCB agreed to address the scandal of sacrilegious reception of the Eucharist by pro-abortion politicians. A 'Committee'6 presented their 'Statement' to the entire Conference. The Statement was put to a vote. Overwhelmingly, 186 bishops in attendance gave it their support, with six bishops abstaining. However, because of what the Statement failed to say, it is not clear whether the six abstaining bishops were in support of denying the Eucharist. The bishops should have stuck to their original plan of having a prayerful retreat that June 2004, instead of just 'retreating' from public view, as they did. The prayers would have done more good than the disappointing 'Statement' that they issued. "Bishops can legitimately make different judgments on the most prudent course of pastoral action." The Bishops leave the impression that one of the options of a bishop is to permit or 'admit' a manifest sinner to Holy Communion. However, this is not correct. This sacrilege and scandal is clearly forbidden by Canon Law c. 915. There are just 16 bishops7 today, out of 268 U.S. active bishops, who will deny a Pelosi or Biden or Kerry-type person Holy Communion in their diocese. 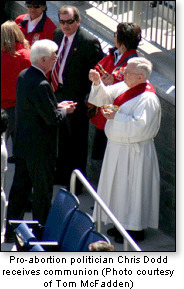 Yet, just 50 miles away in another diocese, these same pro-abort politicians are given the Eucharist. Do the US Bishops need an expensive conference to be thusly divided in collegiality and discipline? Bishop Kicanas addresses the role of bishops being less and less influential in legislation. He believes all that the bishops can now do is catechize the people in the pews. That would be a refreshing change. The USCCB is not 'united' on this matter so what would they teach? Perhaps the USCCB should hold a catechetical class at their next November plenary meeting and study Canon Law, especially c. 915. If the bishops really believe abortion is evil, then why is it acceptable to their Conference that 'bishops can legitimately make different judgments on the most prudent course of pastoral action?" There is a wise old mediaeval scholastic axiom that teaches in Latin: 'Quidquid recipitur ad modum recipientis recipitur.' In English, 'Lessons are received according to the nature of the recipient.' Some persons are obstinately resistant to revealed truth. 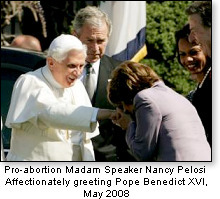 The over 500 'Catholic' pro-abortion legislators are not without intelligence, even though some may act otherwise. They are not ignorant of the Church's timeless teachings on matters of life of the unborn. The reality is, instead, their nature or disposition is what has rejected Church teaching and law. Prohibition8 without enforcement is worthless law. 5 Cf. ABC News/Washington Post Poll, 6/4/04, "Poll: Most Think Church Should Steer Clear of Politics." Cf. "Religion and politics hand-in-hand in 2008 race," 6/1/07, CNN Election Center 2008.